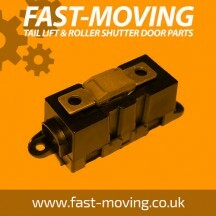 Tail Lift, Auto & Industrial fuse products. There are many manufaturers of tail lift, auto & industrial fuses on the market. We can offer you advice on suitable fuse products to suit your application that will give you a quality product at a super competitive price. Our fuse range includes the following styles of fuses :- Auto fuses,midi bolt down fuses,mini blade fuses,blade fuses,mega bolt down fuses,blade fuses,bolt down fuses,Pudenz square fuses. Anteo tail lifts,Bar Cargolift,Dautel tail lifts,Del equipment UK tail lifts,Dhollandia tail lifts,Elefantcar lifts,Maxon tail lifts,MBB Palfinger,PLS Passenger Lift Systems,Ratcliff Palfinger tail lifts,Ricon tail lifts,Ross & Bonnyman tail lifts,RSG tail lifts (Ray Smith Group),Zepro tail lifts. Mini blade auto fuse. Use with the Mini fuse holder for high current circuit protection..
Blade fuse. Use with the blade fuse holder for high current circuit protection up to 40..
Maxi blade auto fuse. Use with the maxi fuse holder for high current circuit protection..
Mini fuse holders are commly used on tail lifts and for other commercial vehicle application..
Blade fuse holders are commly used on tail lifts and for other commercial vehicle applicatio..
Maxi fuse holders are commly used on tail lifts and for other commercial vehicle application..
Midi fuse holders are commly used on tail lifts and for other commercial vehicle application..
Mega fuse/bolt down fuse holders are commonly used on tail lifts and other commercial vehicl..
Pudenz fuse/bolt down square fuse. Voltage rating 58 VDC, Current rating 100 - 300amp. With t..
Mega fuse/bolt down fuse assembly - 200amp. Use for high current circuit protection up t..